As usual, we start with the mise en place. In addition to the prepared 8×8 baking pan, the ingredients are 8 oz (227 g) of white “chocolate” (I used Callebaut); 3 oz (85 g) unsweetened chocolate (I used TCHO); 6 oz (12 tbl, 170 g) unsalted butter; 2 tsp instant espresso; two large eggs; 150 g granulated sugar; 2 tsp vanilla extract; and 2½ oz (70 g) pastry flour. The white “chocolate” is melted in the bowl — I used the microwave rather than a double boiler — and allowed to cool while the rest of the batter is prepared. The unsweetened chocolate, butter, and espresso powder are melted together in another bowl (again, I used the microwave) and also allowed to cool. 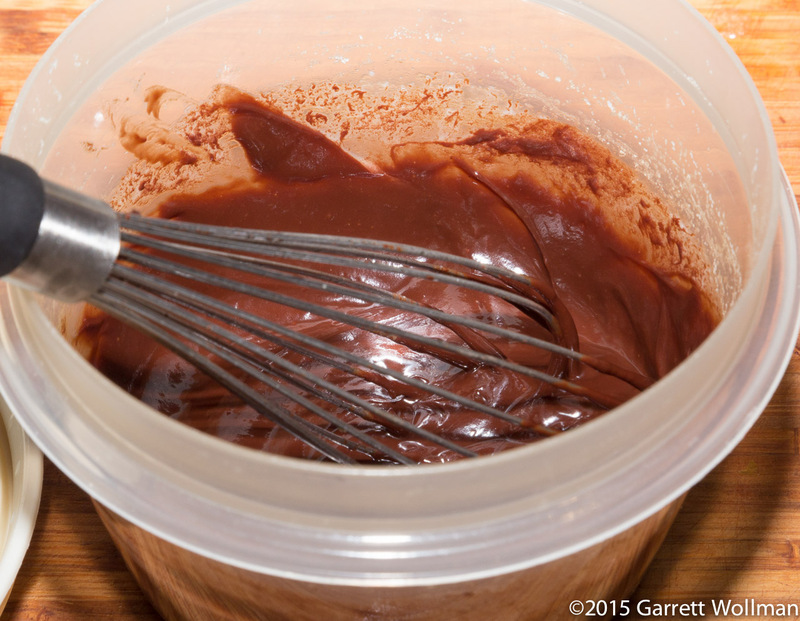 The eggs, vanilla, and sugar get beaten to the ribbon stage using a hand mixer or whisk, and then the cooled chocolate and flour are mixed in until combined; the resulting batter is poured into the prepared 8×8 pan. 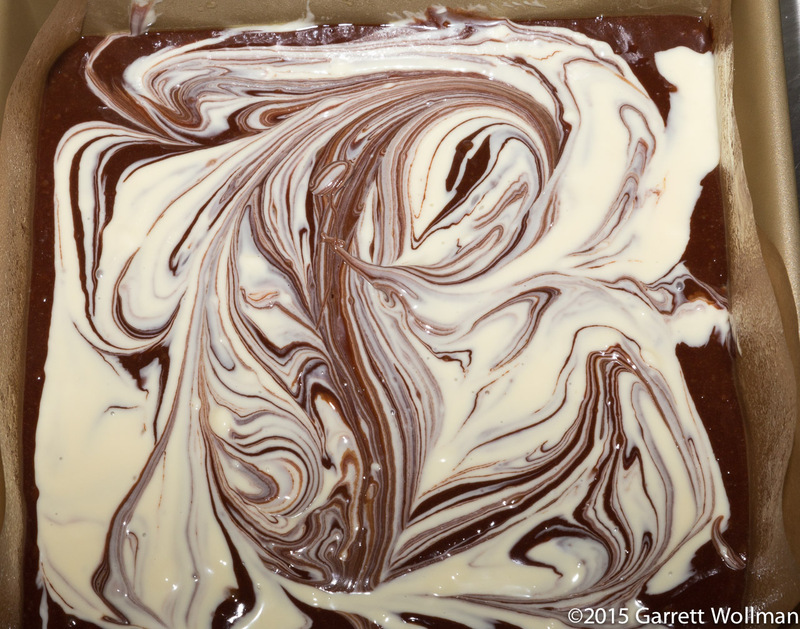 Before baking, the melted and cooled white “chocolate” is spooned on top of the brownie batter and swirled in with a butter knife. I suspect I swirled them a bit too well. This is now ready for baking in a 350°F (175°C) oven for 40 minutes (or perhaps a bit less: the recipe says 30–40, and I thought it wasn’t ready at 35, but perhaps it was a bit too cooked at 40, at least after cooling completely). After baking and cooling, you can see that the white “chocolate” is a lot less distinct than it was before, which is part of why I think I may have swirled it in a bit too well. You can’t see from this photo, but the top crust formed a fairly crunchy surface, although the ganache topping softened it considerably; perhaps a few minutes shorter baking time would have sufficed. The first time I made the “glaze” (properly a simple chocolate ganache) I used Guittard 74% cacao organic baking discs, a new product for me — I should probably put together a tasting of all these different baking chocolates that are available now! — but I screwed it up and managed to break the emulsion in the cream, leaving a liquid layer that would not recombine with the chocolate no matter how much I stirred. I told myself, “This is just a standard ganache, I know how to make a ganache, so let’s just ignore the procedure in the recipe and do it the normal way”, and so I did. Using the same proportions as the original recipe (which called for “chopped bittersweet chocolate or semisweet chocolate chips”, but probably was never tested with the high-test chocolate I was using), I swapped out the Guittard 74% for TCHO 66% discs. I boiled the cream (¼ cup or 60 ml) in a small saucepan on the stovetop, and (taking a trick from Fritz Knipschildt) stirred in a teaspoon of honey; I then poured it over the chocolate (the recipe said a third of a cup, which I weighed out to 70 g) in this Tupperware bowl and snapped the lid on for a minute before whisking together and allowing it to cool for a few minutes. I then spread it over the top of the brownies using an offset spatula, and covered the pan with a sheet of plastic wrap to sit overnight until I was ready to portion. 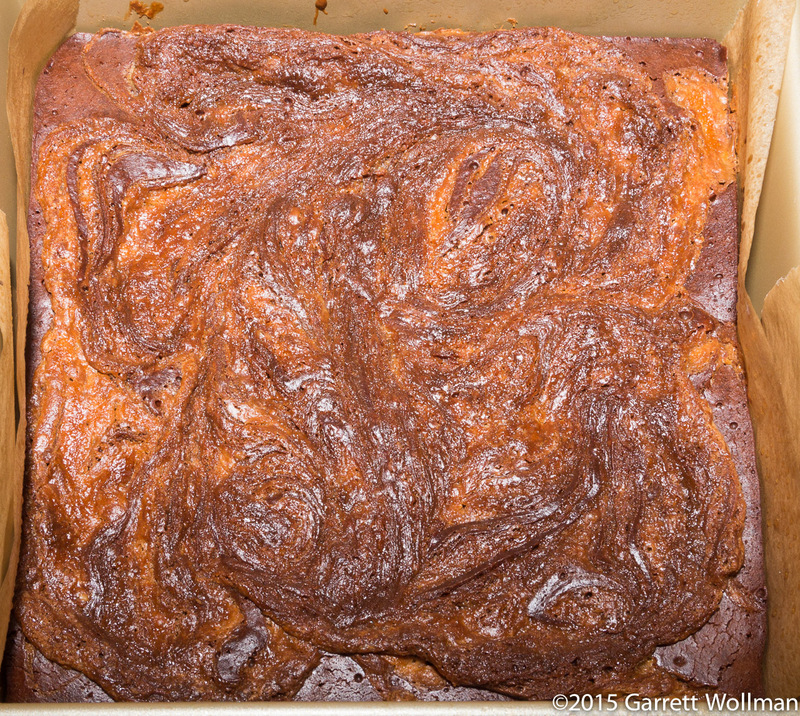 The following morning I removed the brownies from the pan and cut them into sixteen 2×2 squares, then packed them up (separated by sheets of waxed paper) for transportation to the office. And this is what a single brownie looked like. I passed them around at our biweekly “lab lunch”, and gave the remainder to other colleagues. They were generally well-received; two tasters noted a “toffee” flavor — which was good for one of them and not-so-good for the other. Nobody picked out a coffee flavor from the espresso powder, which was much more noticeable in the unbaked batter than it was in the finished product — as it should be. 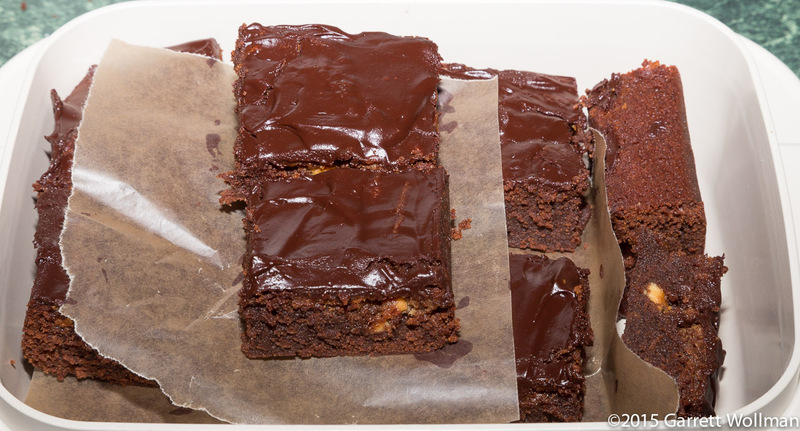 A few people noticed that the texture was a bit unusual, neither cakey nor chewy nor fudgy, but something indeterminate; I’m guessing this is probably a result of the very high cocoa butter content compared to most brownies (11 oz unsweetened chocolate and white “chocolate” together, vs. 2 oz of unsweetened commonly called for in recipes of this size). 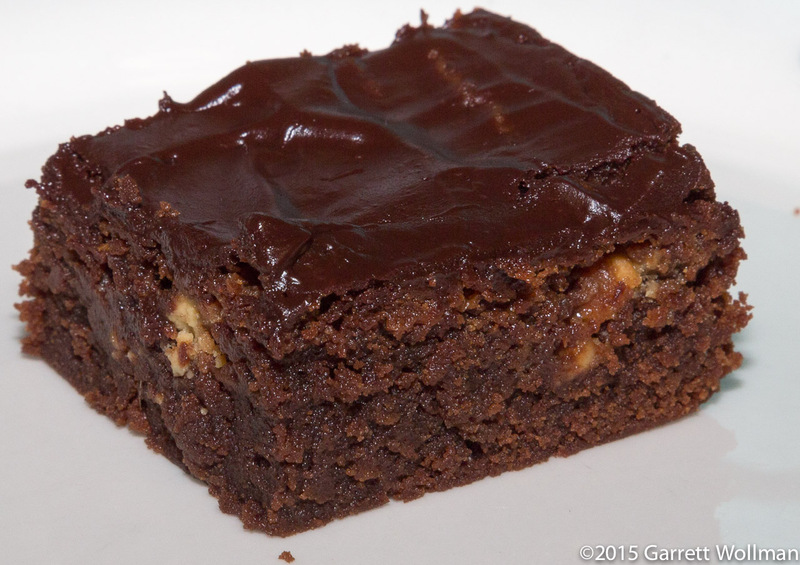 This entry was posted in Food and tagged brownies, Moosewood, recipe. Bookmark the permalink.